It's all blue sky up in here. Warmups aren't something that I really heard of in the design world (i'm sure designers do it though) but it's something that I've come to really like to start my day off with. Essentially it's first thing in the morning, I grab my coffee or tea, fire up the Mac and Ps or Ai and just let my brain run free. Typically there's a lot of thoughts and feelings that I've got running around in my head and I feel like if I repress them, they somehow creep into my day's work. Not the most productive thing to have happening when $$ is on the line and you've got mouths to feed. I feel like it helps to get things off my chest and calm my mind. On an average day warmups are just raw emotions that funnel through a typical style. Whatever works easiest. Sometimes when I feel ambitious I'll challenge myself with a different style that had popped up in my head or some other style that inspired me. It doesn't always work out but that doesn't really matter either. We're not trying to make the Mona Lisa everyday, just clear the cobwebs. And it doesn't have to be something that you show to the world either. It can go up on your Insta/Face/Twit or just sit on your hard drive or if your feeling zen just be relegated to the "do not save" abyss. Anyway, this AM, thoughts of how movies show people die by the hundreds or thousands was really getting at me. There's these "pawns" that we see in movies that are shown as truly useless. They get picked off, go falling down a ravine or elevator shaft, and we all chuckle like it was no bigs. But what we really saw was a representation of a person, one who had thoughts, feelings, emotions, likes, possibly loves, who's life was ended. That made me pause and think about what we're actually watching. I'm not trying to get too profound here but I do want to question what we're putting in our minds. I mean, we try and put the best foods in our bodies. We are what we eat. So shouldn't it also be "we are what we see"? Star Wars is a huge favorite of mine and it's the most familiar (and such a rad design also) so used that as the subject. I used an old Ai illustration I'd made a few years ago that was originally made into a sticker on Sticker Mule. Funny story: companies are pretty good at letting artistic renditions of movies etc. sell on sites like Sticker Mule. Anyway, my stormtrooper lasted a few weeks before the lawyers at Disney put a stop to it. 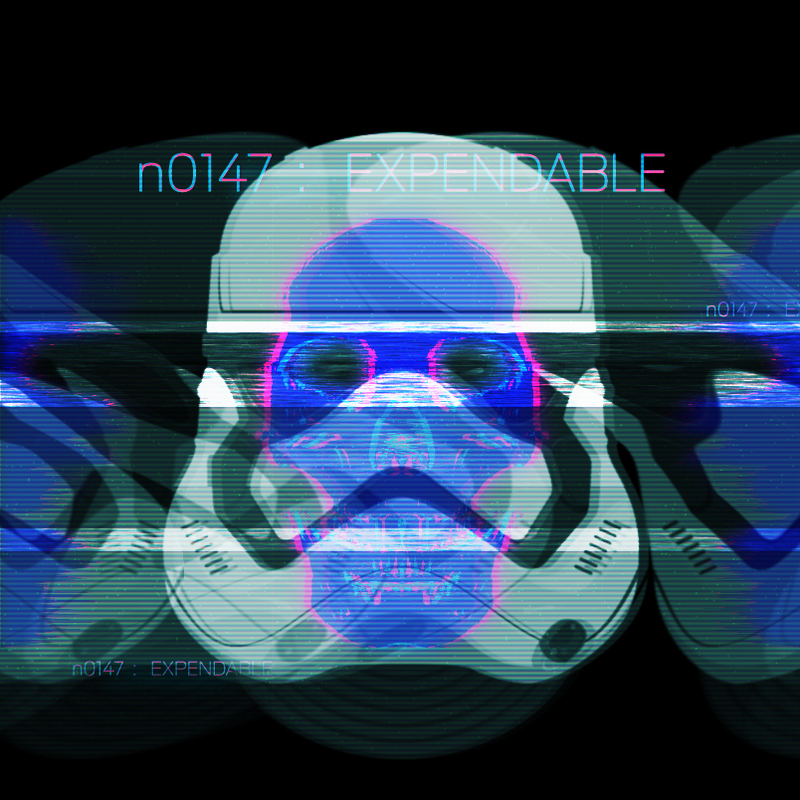 I wondered what was up since there were a few other stormtrooper stickers selling on the site so asked and they said the problem that it was a photo and it had to be an artistic rendition for it to be OK to sell as a work of art. That means my illustration looked like a photo to them! Haha, awesome. That felt pretty good. Anyway, I've always been a fan of color shifts, halftones, and always wanted to do a digital version of that. Try a morning warmup and see if it helps your day out. Cheers! Here's the art for the sticker that Disney kiboshed.